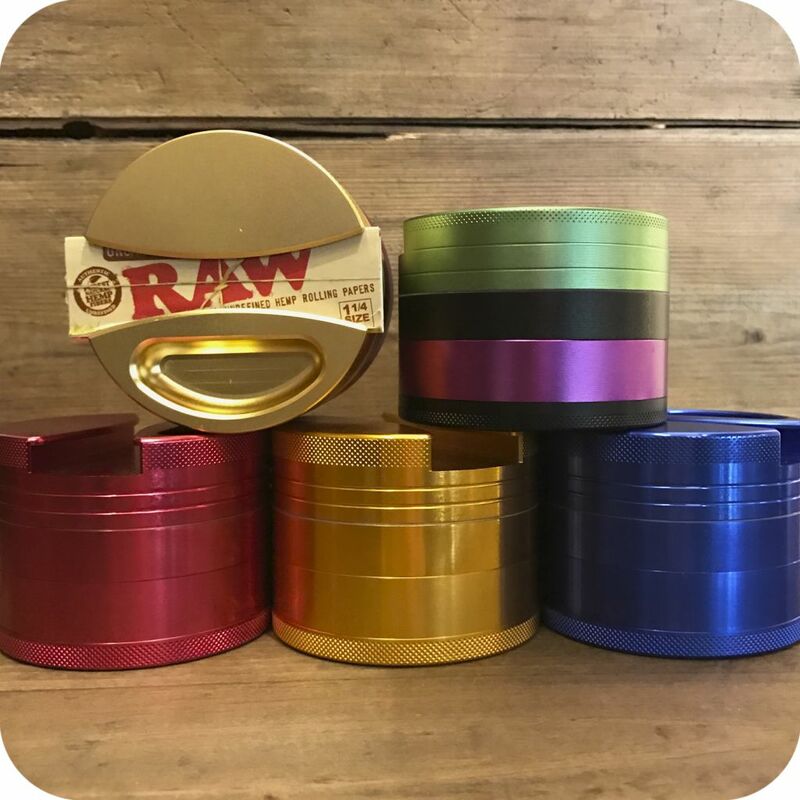 This colorful four-piece metal grinder with ashtray & paper holder is the most convenient, all-in-one grinder you could ever want. 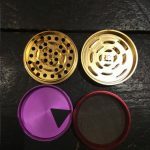 It not only has three chambers for easy grinding and pollen collecting, it also has a nifty slot on the top where you can fit a pack of papers! Next to that is a little dish where you can store herb material or ash. Never go searching for your papers or a place to ash ever again. 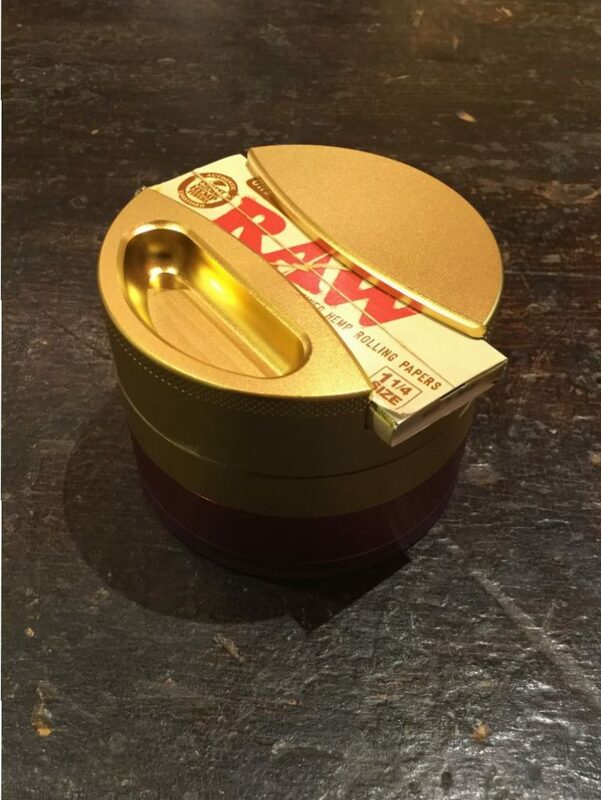 This grinder is the definition of high-end smoking. In the first chamber, razor-sharp metal teeth ensure your legal herb is ground to perfection. 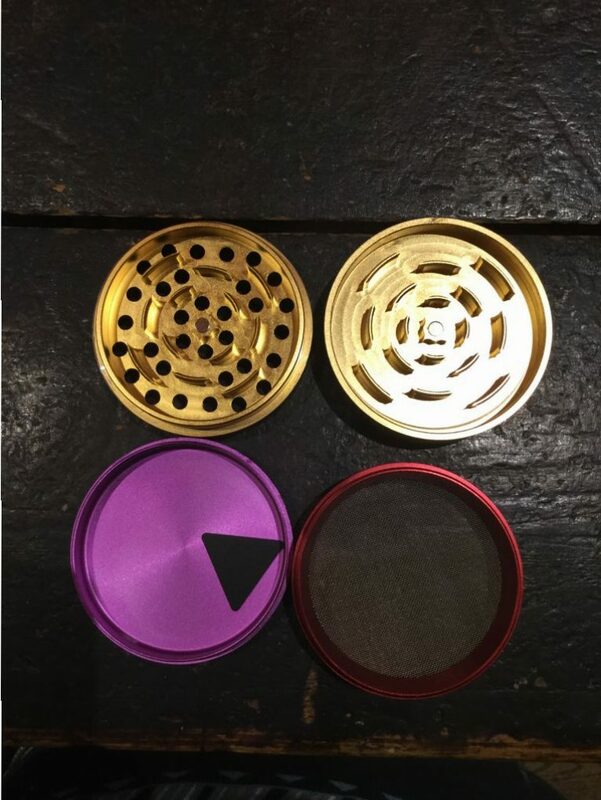 The ashtray and paper-holding feature isn’t the only thing that makes this grinder unique. These grinder’s set of teeth are unlike any other because of their curved, radiating shape. 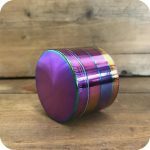 The lid locks on magnetically for a smooth, elegant grinding experience. Pack in your dry material, snap the lid on, and twist away. 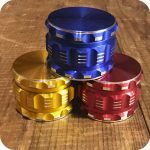 The fine mesh layer located in the second chamber allows for only the finest material to fall through to the bottom chamber. 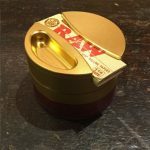 This creates an accumulation of pollen, the finest and most precious part of legal herb. Pollen is perfect for sprinkling on top of a bowl or in a rolled herbal cigarette. Also, pollen is always good to have on hand whenever you’re low on herb. Collecting pollen never seemed easier! 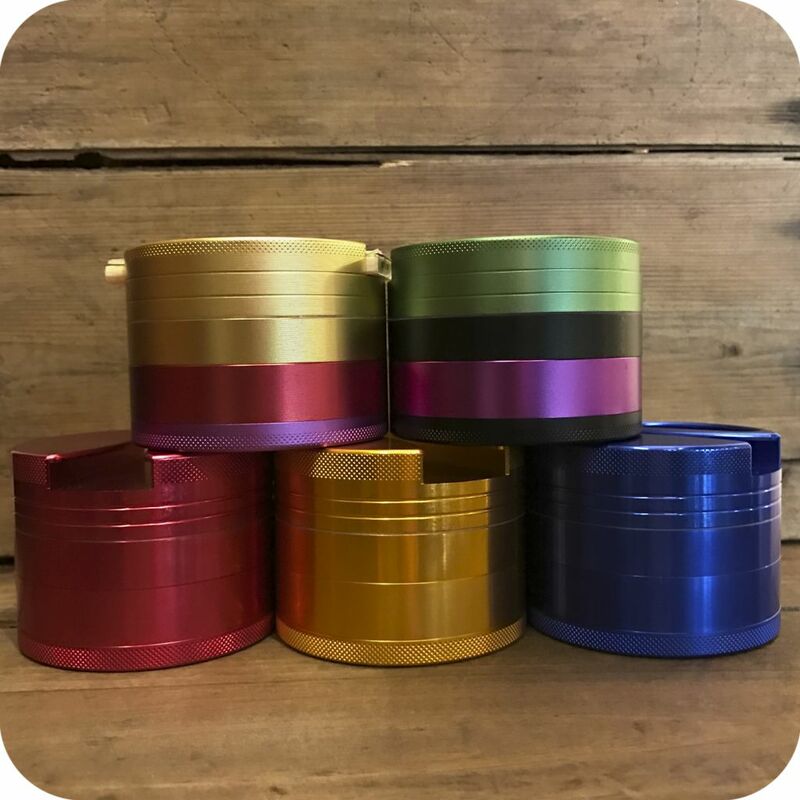 These grinders are made of sturdy, high-quality aluminum metal, and are sure to be at your service through thick and thin. Additionally, the included plastic collecting tool makes it effortless to scoop and use your pollen. 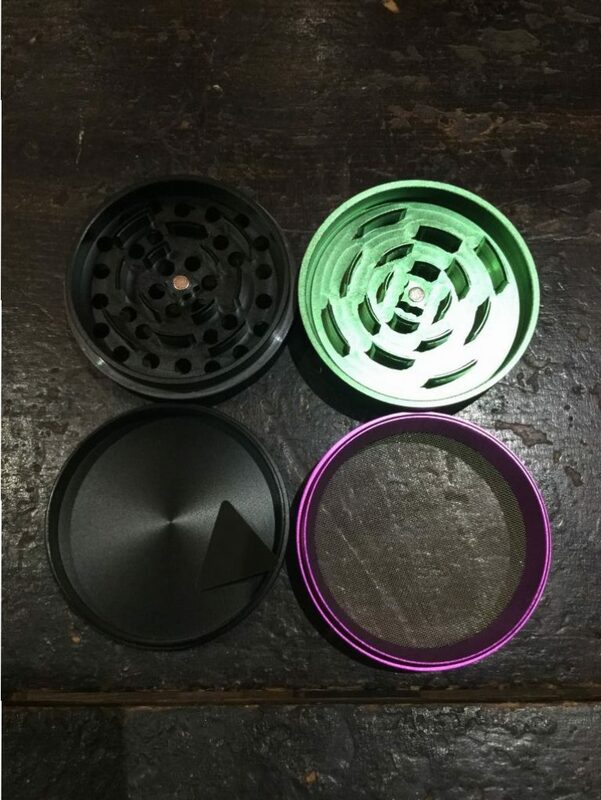 Furthermore, the rolling paper slot and the dish makes it uniquely practical, easily becoming anyone’s new favorite grinder. 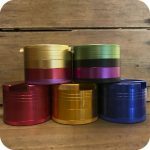 These amazing grinders come in an attractive array of color schemes. Please specify which color you’d like in your order. 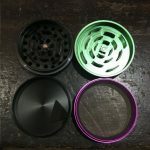 Tags: 4 piece grinder, ashtray, Grinder, grinders, Metal Grinder, paper holder.